Skiing and snowboarding the Alps is a dream come true for every fan of winter sports. 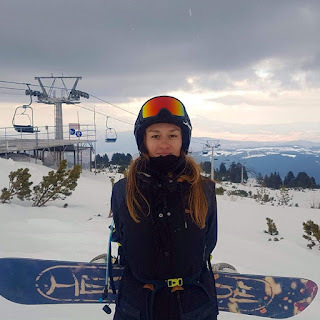 I was lucky enough to experience the magic of snowboarding the Alpine slopes too. Here are some of the places we visited, as well as my impressions. Let me first begin with the route from Bulgaria to Mayrhofen. Our starting point was Sofia, then Belgrade. We were driving with 3 other cars and someone took the decision to go to Budapest, Vienna, then we drove almost to Munich in Germany and finally arrived in Mayrhofen. After 20 hours of driving during the night, we were exhausted. I would definitely not make the same mistake again. 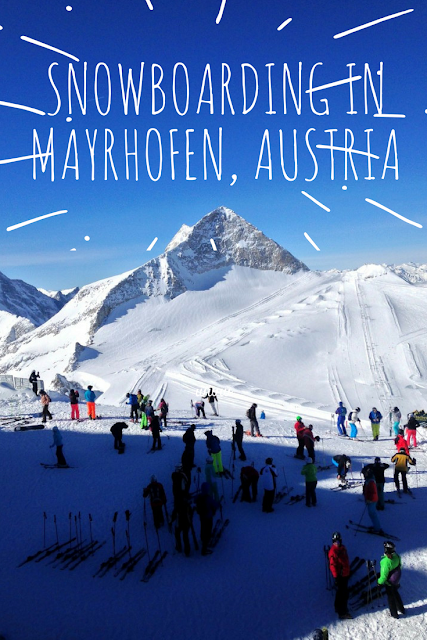 Find information about the fastest route from Sofia to Mayrhofen at the end of this article. Mayrhofen is a town in the Zillertal valley in Tirol, Austria. We were staying at Mühlbach - a small village nearby. There was a gondola lift right next to our house. On the first day, we tried the Mayrhofen – Hippach area. There were many slopes to choose from, as well as perfect conditions for skiing. Austria’s steepest slope, called Harakiri with 78% gradient is situated here. Of course, I didn’t even dare to step on it. After a long day of snowboarding, we had a pint of beer at the Vans Penken Park lounge – a meeting point for the international freestyle skiers and snowboarders. On the 2nd and 3rd day we went to Hintertux glacier just 25km away from Mayrhofen. This area became our favourite not only because of the perfect conditions for freeriding but also because the views were fascinating and the snow was plenty enough for us to make our trails in the white powder. To reach the top you get 3 glacier gondolas that take you to a panorama in the heart of the Alps. Riding here was exciting and fun. I have never seen so much snow in my life before. At the altitude of 3500m, you get to see part of the glacier and even touch it – so cool! On the fourth day, I took a break from snowboarding and had the opportunity to walk around Mayrhofen. My ski pass for 6 days allowed me to use the public transport there for free. Although the town’s attitude is 600m (just like Sofia), the weather was constantly changing from snowing, to sunny, to raining. The last day we went to the Hochzillertal-Kaltenbach ski area. It was fun, but not as fun as the Hintertux glacier which became our favourite spot. After a week of fun in the snow, it was time to go home. Our way back to Bulgaria went through the heart of the Alps towards Slovenia, following Croatia and Serbia. It was the best road trip ever. And way shorter (around 15 hours of driving). 1. One of your feet must be fastened to your snowboard bindings when you take the lifts. Always. 2. All shops are closed on Sundays - I am always surprised with this fact, but if you just like me aren't used to it, then you should know it. 3. 1 ski pass covers the whole Mayrhofner Bergbahnen ski area - a very cool fact that allowed us to explore 3 mountain areas using 1 ski pass. 4. The pistes cover 136km - they are numerous and there is something for everyone. You are living the life, Sany! And skiing looks so much fun! I have never tried though but we live really close to a mountain where it's a popular ski resort. Great post , love the photos! Thanks, Helena. Glad you like the photos! Awww, thank you for your kind words, Tijana! I love your blog too! It's always so entertaining with great content and photos! Yes, the trip was tiring, but at least we made it to Mayrhofen :D I know you will be a great skier/snowboarder so go ahead! Thanks for your comment once again! How amazing it must've been to fulfill your dream of riding in the Alps! Snow doesn't get any more beautiful then when it's covering some magnificent peaks. It really sounds like you had the time of life snowboarding there. Thanks for sharing your experience Sany! Love the pic of you and the Hintertux glacier! For someone who loves winter sports as much as you do, it must have been such an amazing experience. Thanks for sharing the beautiful views! So awesome... як кеф! I can imagine how great of a time you had. It looks so magical, пистите страхотни. Cool photos. Haha, беше супер! Thank you, Radi! Гледките от планината са фантастични. Невероятна красота. А и градчето е доста живописно . Затова би се върнала там пак . Снимките са супер . Hi, Ivonne. Yes, the road trip was exhausting but it was worth it. Thank you very much for your kind words. I could use a vacation in Austria right now. So hot in here right now!